This module is not visible from Administration Panel, it’s created for students only so they could add courses to the Wish List or to the Shopping Basket. If the course is not free there will be a button “Add to Shopping Cart”. All courses (paid and free) can be added to the Wish List. When clicking “Add to Shopping Cart” or “Add to Wish List” the course is automatically added to the Shopping Cart/Wish List. The user can check the Shopping Cart and Wish List and there will be all selected courses. This option is designed to let the student choose a necessary course so the system would remember it and save it in the profile of user. The user can add any course to the wish list, no difference if it’s free or paid. The link “Add to Wish List” is available in the list of courses next to the course name. If the course is already in Wish List, the link will disappear. There is a possibility to remove a course from the Wish List or pay for it. When a student is in Wish List he/she will see “Add to cart” link next to every course. So this course will be automatically moved to Shopping Cart and disappear from Wish List. 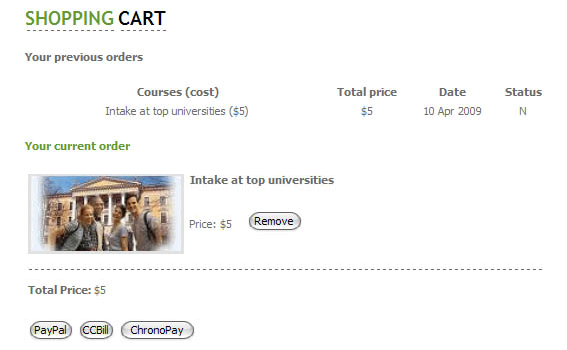 Shopping cart includes all courses user can pay for. There will be available all Payment methods indicated in the Admin Panel of the website. After student pays for the course Administrator of the site will need to confirm that he has received this payment. He will need to check a box “Payment received” and save all results. After that the student will be able to read the course. All payments from students are saved in the section “Payments list” in Administration panel. If the course is already in the Shopping Cart or it’s already paid, there will be no “Add to Shopping Cart” button available in the list of courses. 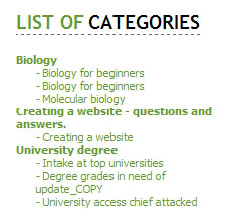 If the course is added to the basket, it will be available in this section. If the course is already passed it will have a “Certificate” button in .jpeg and/or .pdf formats. The user can add new courses to pay in the Shopping Cart section as well. There is a section with all available courses to the left of the Shopping Cart items. He just needs to click the necessary course item and it will be added to the Shopping Cart automatically.